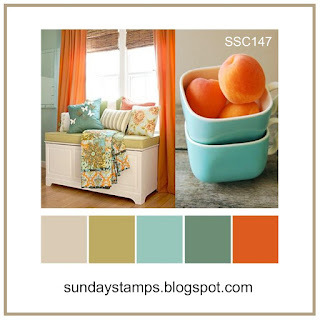 Twinkling Paper Studio: Spring is in the Air! I've made (and sent) a ton of cards this week but I have been busy with other things and have not gotten a blog post written. I entered a couple of cards from my photos on Instagram but I wanted to get a short post written with a link back to the challenges where I entered them. The first Challenge I entered was over at the Double D where we had this mood board as our inspiration. My mind has totally been in a "Spring is Here" mode this week as our trees have tiny little leaves of green on them. So even though it isn't officially Spring, it will be here soon enough. Tulips along with crocuses and hyacinths are among the first to bloom each year and I really love tulips. The Tulip Time Stamp and Die Sets from Papertrey Ink are just the very best ones out there. I loved them last year and even more so this year. I miss not having flowers blooming each spring in my yard. This particular card was made for my sweet friend, Amanda. She is a Warrior in Pink who has spent the last two years battling breast cancer, did 18 rounds of chemo and had 6 surgeries. In the face of it all, she never once lost her faith in God. I started sending cards to her when she was in the early stages of treatment and have continued that trend. I made this one especially for her -- my Warrior in Pink! The second Challenge I entered was the Sunday Stamps Challenge where this week's inspiration is Cottage Colors. It just so happens that I made an Easter Card using these colors that I am sending to one of my Sisters In Law. I was doing a little experiment with some inks this week and this card uses the blooms that I created using the technique. To get the pale to mid-tone peach colors, I first stamped the bloom of the tulips with a light layer of Brilliance Moonlight White Pigment Ink. Then I stamped additional layers of dye ink on top of that to get the softer variation of color. I actually do have enough variety in my inks that this step wasn't necessary, but I love the shimmer it added to the blooms by doing this. I did some ink blending on the backgrounds of each of these cards and then scored the lines into the diamond background. I like the visual interest and extra texture that gives to the background. After the score lines were in I misted the background with Tattered Angel Iridescent Gold Shimmer Mist and set them aside to dry for a while. Once they were dry I assembled the bouquets and finished up the cards. I don't think I will ever get tired of stamping these Tulips. They are so real looking and beautiful. Betsy Veldman really outdid herself when she designed these and I hope we get another set in this style this year. Thank you so much for stopping by today. I hope you'll come back soon to visit. Both cards are just beautiful Vicki and prayers go up for your friend Amanda! God Love Her!!! 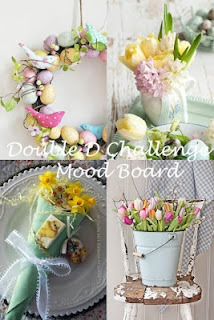 Thanks so much for joining in the fun at our Double D ‘Think Spring’ challenge! We hope you’ll come back often. Both your cards are simply gorgeous! You do beautiful work. The scoring and shading and touches of gold are pure delight. You're a good friend to Amanda. Thanks so much for sharing in our Spring Challenge at Double D.
Beautiful cards, both make me want Spring and my flowers blooming their little heads off and you are right, those tulips are a beautiful stamp..fabulous card!! Thank you for joining our challenge at Double D! Beautiful cards! I love the tulips and I have to say that I love those scissors! Thanks so much for playing along at Double D Challenges!